I had so much fun doing the Thurman Munson card, I thought I'd move on to the next 1971 Topps action card that is even remotely possible to determine the game. 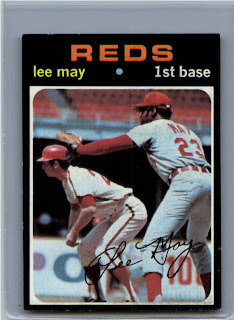 This card is of Lee May holding a currently unknown Phillie on first base. So, we are left with a Phillies home game, Lee May on first and an unknown Phillie with a jersey number beginning with 2, obviously a 20-something. But what number? Review of the Phillies roster from 1970 gives us: Jim Hutto (#20), Ron Stone (#21), Larry Hisle (#22), Oscar Gamble (#23), Byron Browne (#24), Scott Reid (#25), Sam Parrilla (#27) and Grant Jackson (#29). Hisle, Gamble, Browne and Jackson are out for obvious reasons. That leaves us with Hutto, Stone, Reid and Parrilla. Philly hosted the Reds 6 times in 1970, and Parrilla did not appear in any of those games, so now we are left with Stone, Hutto and Reid. Stone appeared in 5 of those 6 games, Hutto in 2 and Reid in 2. From the card, we can plainly see that it is a day game, sorry Night Owl, and of the 5 potential games, only one was played during the day. The June 14, 1970 day game. In that game, Stone and Reid appeared, so Hutto is out. Reid pinch hit, but grounded out to second. That leaves Stone. Our mystery baserunner has been solved! 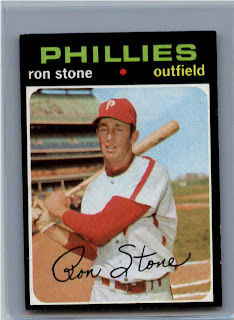 Stone was 1 for 3 in the game with a RBI and a walk. May was 2 for 2 with 2 runs and 2 ribbies. Stone had a single in the first scoring Gamble, but advanced to second on the throw. McGlothlin walked Stone in the bottom of the 4th, lined out in the 6th and hit into a double play in the bottom of the 9th. Looks like the 4th inning is it! Therefore, the action in this card is of Lee May holding Ron Stone at 1st in the bottom of the fourth after a walk from McGlothlin. Stone would later be forced out at second, and the Reds beat the Phillies 10 to 1 on a CG by McGlothlin. Nice detective work. Obviously not a sell-out! And I thought my Junior Kennedy card was some awesome "baseball card forensics"!! Great research dude! Very cool. Told my wife how you figured this out. She sort of grunted something affirmitive. Rolled her eyes as well. Anyway, very interesting, I've never really thought to look into stuff like that. Now, you need Ron to autograph both cards. Awesome blog. FYI, clearly the 1971 Chris Short card is from the same game. He started that game (and lost) and Pete Rose in the background had a couple of hits.